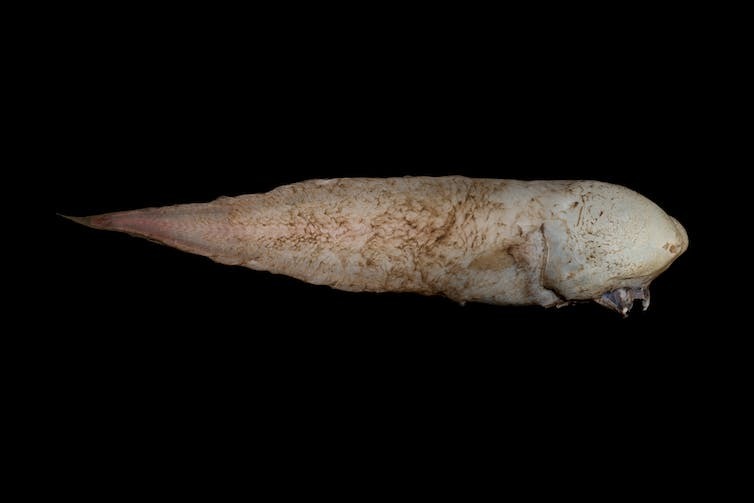 The famous “faceless fish”, which garnered worldwide headlines when it was collected by the expedition. Over the past five weeks I led a “voyage of discovery”. That sounds rather pretentious in the 21st century, but it’s still true. 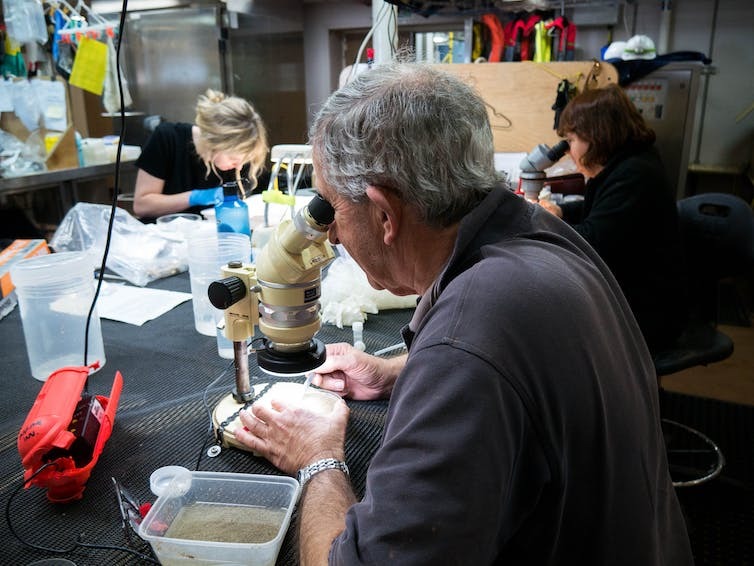 My team, aboard the CSIRO managed research vessel, the Investigator, has mapped and sampled an area of the planet that has never been surveyed before. The RV Investigator in port. Bizarrely, our ship was only 100km off Australia’s east coast, in the middle of a busy shipping lane. But our focus was not on the sea surface, or on the migrating whales or skimming albatross. 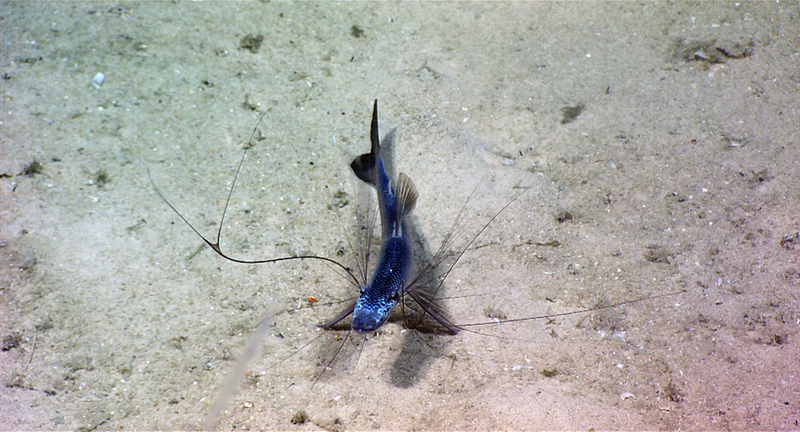 We were surveying The Abyss – the very bottom of the ocean some 4,000m below the waves. To put that into perspective, the tallest mountain on the Australian mainland is only 2,228m. Scuba divers are lucky to reach depths of 40m, while nuclear submarines dive to about 500m. We were aiming to put our cameras and sleds much, much deeper. 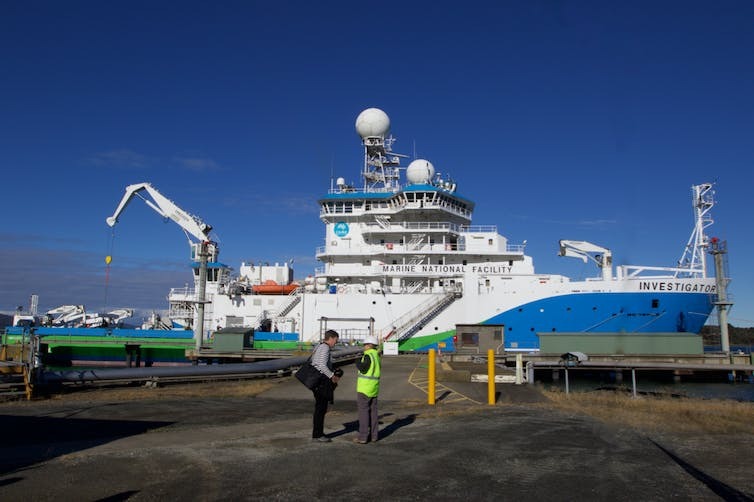 Only since 2014, when the RV Investigator was commissioned, has Australia had the capacity to survey the deepest depths. The months before the trip were frantic, with so much to organise: permits, freight, equipment, flights, medicals, legal agreements, safety procedures, visas, finance approvals, communication ideas, sampling strategies – all the tendrils of modern life (the thought “why am I doing this?” surfaced more than once). 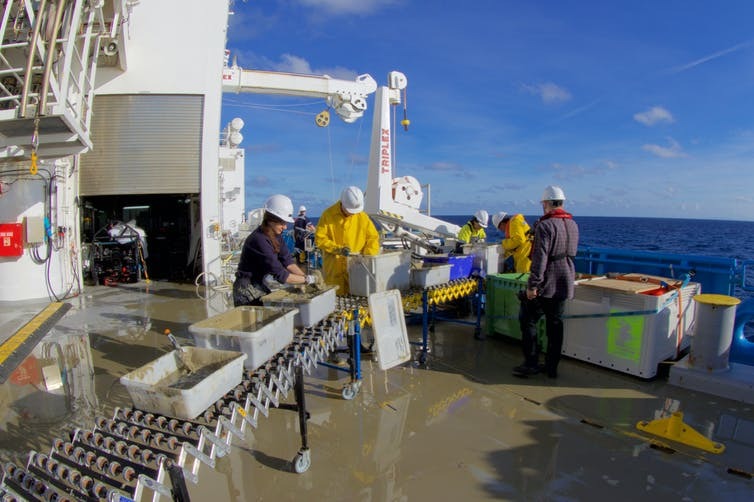 But remarkably, on May 15, we had 27 scientists from 14 institutions and seven countries, 11 technical specialists, and 22 crew converging on Launceston, and we were off. Life at sea takes some adjustment. You work 12-hour shifts every day, from 2 o’clock to 2 o’clock, so it’s like suffering from jetlag. The ship was very stable, but even so the motion causes seasickness for the first few days. You sway down corridors, you have one-handed showers, and you feel as though you will be tipped out of bed. Many people go off coffee. The ship is “dry”, so there’s no well-earned beer at the end of a hard day. You wait days for bad weather to clear and then suddenly you are shovelling tonnes of mud through sieves in the middle of the night as you process samples dredged from the deep. Shifting through the mud of the abyss on the back deck. Surveying the abyss turns out to be far from easy. On our very first deployment off the eastern Tasmanian coast, our net was shredded on a rock at 2,500m, the positional beacon was lost, tens of thousands of dollars’ worth of gear gone. It was no one’s fault; the offending rock was too small to pick up on our multibeam sonar. Only day 1 and a new plan was required. Talented people fixed what they could, and we moved on. I was truly surprised by the ruggedness of the seafloor. From the existing maps, I was expecting a gentle slope and muddy abyssal plain. Instead, our sonar revealed canyons, ridges, cliffs and massive rock slides – amazing, but a bit of a hindrance to my naive sampling plan. But soon the marine animals began to emerge from our videos and samples, which made it all worthwhile. Life started to buzz on the ship. Like many people, scientists spend most of their working lives in front of a computer screen. It is really great to get out and actually experience the real thing, to see animals we have only read about in old books. The tripod fish, the faceless fish, the shortarse feeler fish (yes, really), red spiny crabs, worms and sea stars of all shapes and sizes, as well as animals that emit light to ward off predators. 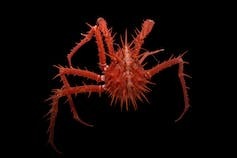 A spiny red lithodid crab. 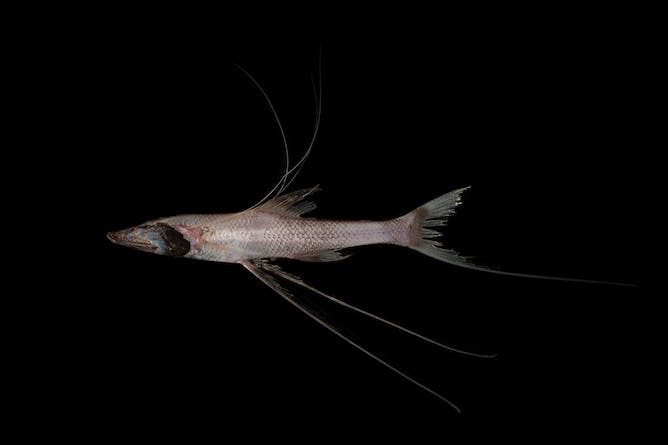 The tripod fish uses its long spines to sit on the seafloor waiting for the next meal. The important scientific insights will come later. It will take a year or so to process all the data and accurately identify the samples. Describing all the new species will take even longer. All of the material has been carefully preserved and will be stored in museums and CSIRO collections around Australia for centuries. Scientists identifying microscopic animals onboard. On a voyage of discovery, video footage is not sufficient, because we don’t know the animals. The modern biologist uses high-resolution microscopes and DNA evidence to describe the new species and understand their place in the ecosystem, and that requires actual samples. 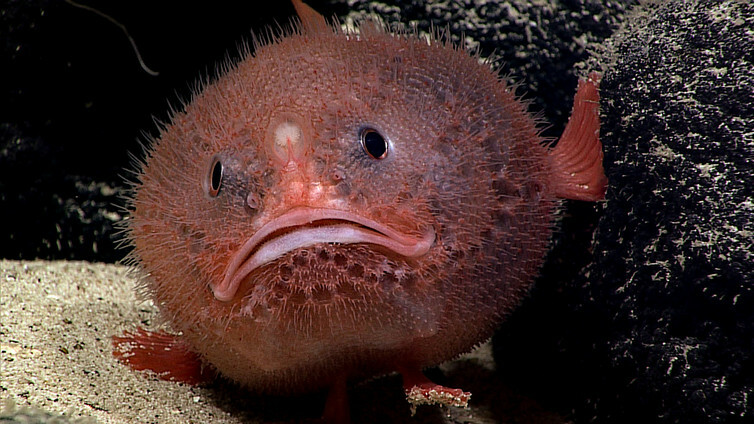 So why bother studying the deep sea? First, it is important to understand that humanity is already having an impact down there. The oceans are changing. There wasn’t a day at sea when we didn’t bring up some rubbish from the seafloor – cans, bottles, plastic, rope, fishing line. There is also old debris from steamships, such as unburned coal and bits of clinker, which looks like melted rock, formed in the boilers. Elsewhere in the oceans there are plans to mine precious metals from the deep sea. Rubbish found on the seafloor. Second, Australia is the custodian of a vast amount of abyss. Our marine exclusive economic zone (EEZ) is larger than the Australian landmass. The Commonwealth recently established a network of marine reserves around Australia. Just like National Parks on land, these have been established to protect biodiversity in the long term. Australia’s Marine Biodiversity Hub, which provided funds for this voyage, as been established by the Commonwealth Government to conduct research in the EEZ. The newly mapped East Gippsland Commonwealth Marine Reserve, showing the rugged end of the Australian continental margin as it dips to the abyssal plain. The scale shows the depth in metres. Our voyage mapped some of the marine reserves for the first time. Unlike parks on land, the reserves are not easy to visit. It was our aim to bring the animals of the Australian Abyss into public view. We discovered that life in the deep sea is diverse and fascinating. Would I do it again? Sure I would. After a beer. But in reality this “monster”, a black seadevil, is only about 9 cm long, which would make it about a third of the size of Dory and potentially smaller than Marlin or Nemo. 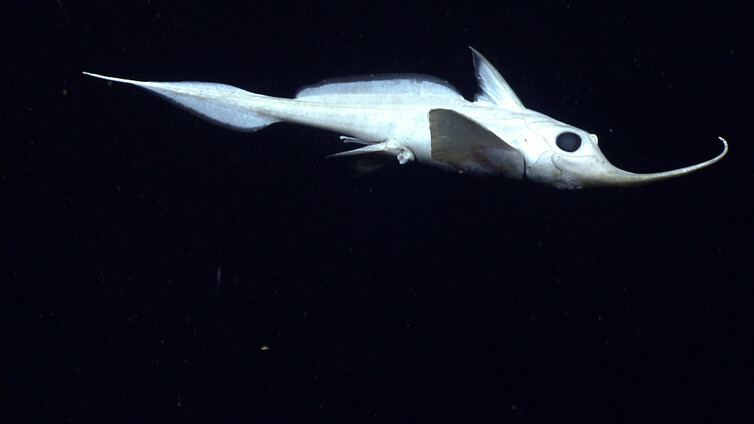 A tripod fish deep below the Atlantic Ocean. The public’s perceptions are often based on how ‘cute’ an animal is.